Left to right: Ira Provost, Dr. Leroy Little Bear, Julaine Guitton, Dr. Pamela Rose Toulouse. Dr. Michelle Hogue, Darren Googoo, Francis First Charger. Photo by EdCan Network. On October 12th, in an effort to address this tension, the national EdCan Network organized a professional learning event for over 200 teachers at the University of Lethbridge called “Truth and Reconciliation in Every School: What we know, what we don’t know, and what we need to do to move forward respectfully” – an acknowledgment that the road to reconciliation is not only an ongoing process that everyone is called to take up, but also a challenging personal investment that will unfold differently for each educator. 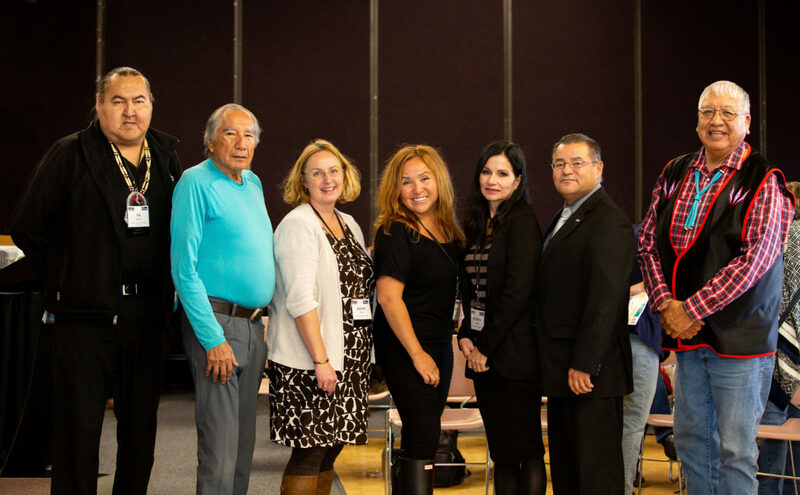 The event catered directly to teachers and teacher candidates – regardless of where they might be along their journeys – and convened authors who had written for the recently-published Education Canada magazine special focus on Truth and Reconciliation in the Schools, which maps the progress Canadian public schools are making on this front. During the event’s main panel discussion, speakers affirmed the need for educators to assess their intentions and work towards navigating from a place of heart, in lieu of ‘walking on eggshells’ and remaining stagnant out of fear of asking a silly question that could offend someone. Grounded in the view that not doing anything is likewise wrong, speakers accentuated how no one will ever feel 100 percent ready to take up this challenge – that teachers need to be brave enough to say “I don’t know,” which is critical when working with Indigenous peoples and marginalized communities, according to panellist Dr. Pamela Rose Toulouse. Beyond those three words follows a willingness to reach out to valuable human resources – school district Indigenous consultants, Elders, Knowledge Keepers and those with authentic expertise – so that teachers can advance their own knowledge, build trust-based relationships, and work collaboratively with Indigenous peoples to teach all students about treaties, residential schools and long-standing issues facing Indigenous communities.